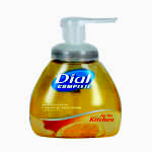 Antibacterial and antimicrobial, this patented germ killing hand wash also has a gentle side. Kills germs, yet is gentle on hands while providing a rich, luxurious lather. Contains vitamin E and aloe. Fresh Fruit fragrance.